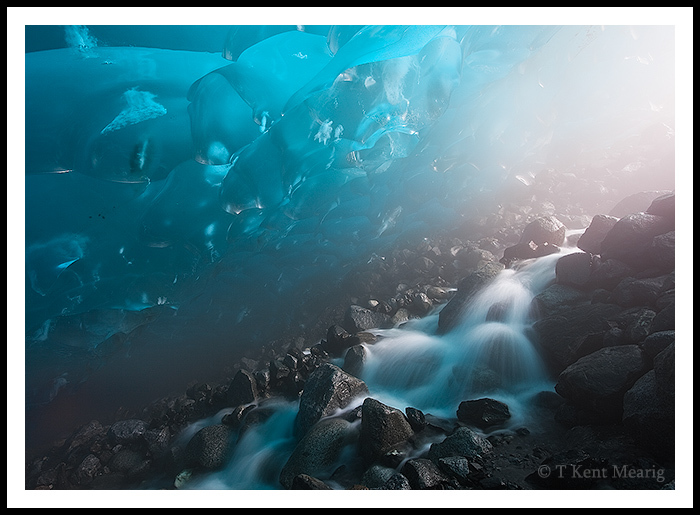 The day before the whale watching tour, I spent the evening out on the Mendenhall Glacier with my good friend Corey. It’s quite rare for either of us to be somewhere new on the lower portions of the Mendenhall (especially Corey), but that was the goal as we started kayaking across the lake. As the glacier recedes, not only does the terminus back up the valley, but the lateral flanks of the glacier melt away to reveal new land features. Some of the most interesting things uncovered in the last few years have been waterfalls. The waterfalls on the west edge (roughly 1500 ft up from the lake) were our destination, but since light leaves Juneau’s south facing valleys remarkably early in the summer day, photography was difficult. Instead of sharing a sequence of images here, I’m trying my first video entry to the blog. All video was recorded with the new 5DII, and unlike most of the fancy videos made with this camera that are floating around the web, this short segment gives you an idea of what might be accomplished using this tool by someone with absolutely no idea what they’re doing with a video camera or with editing software. Also, the last few clips of the cave are actually from a few days later. Even though we discovered the cave late on the original evening of exploring, light levels were far too low by ten o’clock to do any photography or video. Awesome, loved the video Kent. Cool video Kent, love that shot!